The page you requested requires you to log in. After you log in successfully you will be redirected to the requested page. × Database updates are currently in progress. You may encounter minor slowing of report loading. There was a problem rendering the content. Please refresh your brow-fluidser or try again later. Transport is a virtual, real-time picture of customers' survey feedback and is the most convenient and timely means to view your survey data. Updated daily, Transport is filled with features allowing a clear understanding of your team's strengths, trends, and opportunities. Please contact us with any questions or feedback. Thank you! 2019 HomeBuyers' Choice Awards recap! A recap of some of the latest and coolest Transport features. Summarizes your customers' ratings on the EIGHT referral driver questions having the strongest impact on Willingness to Recommend. Shows customer ratings of each representative by name. Contains every individual rating and verbatim comment provided by each customer. Identify homeowners that are definitely willing and likely to refer. Insight into a customer’s specific thoughts on issues you would never hear them say aloud. Customers rate each vendor by name. Use your Transport credentials to gain access to all your data. Eliant is the foremost consumer research company catering to the new home industry. Our consumer tracking tools and information management systems provide our clients with timely, actionable information and strategies to improve their customer’s experience. Transport is a virtual, real-time picture of customers’ survey feedback and is the most convenient and timely means to view survey data. To learn more about Eliant, visit http://www.eliant.com. TRANSPORT has been an incredible tool for us on a regular basis to closely monitor our homeowner satisfaction ratings from move-in through the first year of occupancy allowing us to make improvements to our internal processes. TRANSPORT is a great real time tool to use in Monthly Customer Care & Bi-weekly Staff meetings. TRANSPORT is Century Communities’ “go to” resource for all things Eliant. 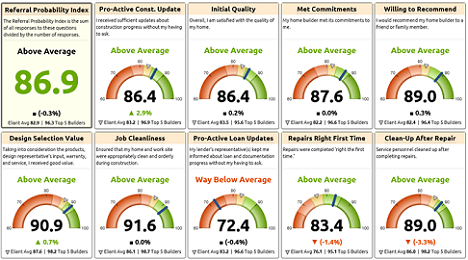 It’s an invaluable tool for our Division Presidents and field operators to get a real-time pulse of their ability to deliver a great homeowner experience.